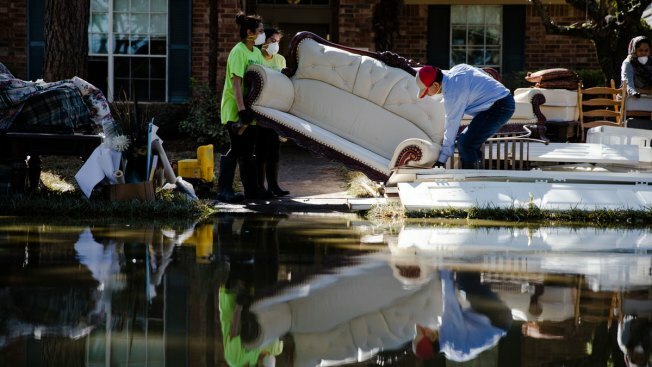 In this Sept. 7, 2017, file photo, homeowner Sohail Soomro, center right, accompanied by his family, dumps flood damaged furniture on his front yard in the aftermath of Hurricane Harvey at the Canyon Gate community in Katy, Texas. Harvey and Hurricane Irma inflicted heavy damage on Texas and Florida in September, likely leading to a low number of jobs gained in the month. The U.S. lost 33,000 jobs in September after Hurricanes Harvey and Irma hit Texas, Florida and other Southeastern states. It was the first decline in seven years. The unemployment rate fell to 4.2 percent from 4.4 percent, the Labor Department said Friday, the lowest level since February 2001. Looking past the hurricanes' impact, the job market and economy generally look healthy. Some economists expect job growth to rebound in the coming months as businesses in the area reopen and construction companies ramp up repair and renovation work. Last month's drop was driven by huge losses in restaurants and bars, which shed 105,000 jobs, a sign of the damage to Florida's tourism industry. Roughly 1.5 million people were unable to work last month because of the weather, the government said, the most in 20 years. More than 11 million people had been employed in the 87 counties in Texas and Florida that were declared disaster areas, the government says. That's equal to about 7.7 percent of the nation's workforce. Hourly employees in the area who couldn't work and missed a paycheck were counted as not working, thereby lowering the September job gain. That's true even if those employees return to work after the storm passes. Other recent indicators point to a solid economy and job market. On Wednesday, a survey of services firms — covering restaurants, construction companies, retail stores, banks and others — found that they expanded in September at their fastest monthly pace since 2005. That followed a survey of manufacturers, which found an equally strong gain. Factory activity expanded at the fastest pace in more than 13 years. There are signs that a rebound from the hurricanes is already boosting the economy. Auto sales, which had been lackluster this year, jumped 6.1 percent to more than 1.5 million in September from a year ago, according to Autodata Corp., as Americans began to replace cars destroyed by the storms. That increase in purchases should soon lead automakers to step up production. Harvey caused about $76 billion to $87 billion in economic losses, according to Moody's Analytics, an economic consulting firm. The estimate includes damage to homes and businesses as well as lost business and economic output. That calculation would make Harvey the second-worst U.S. natural disaster, after Hurricane Katrina in 2005. Irma will likely end up having caused $58 billion to $83 billion in economic losses, Moody's forecasts. Maria, which hammered Puerto Rico and the U.S. Virgin Islands, could cost $45 billion to $95 billion, though that is a preliminary estimate.